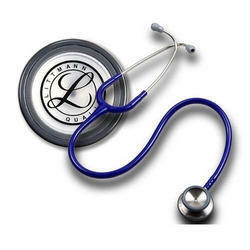 We are leading manufacturer and supplier of Lithman Stethoscope used in hospitals and doctors. These are fabricated in accordance to the international and global quality norms. They are professionally designed for international acceptance. It is available different sizes and it covers large variety of acceptance. 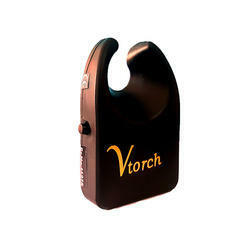 These are well designed are compact in size and can be handled easily. These are manufactured using high grade raw material and are corrosion proof and durable. Our Pill Boxes are capable of keeping the medicines very shapely and without really disturbing the medicinal qualities inside it. This modern box is designed in a very special way to keep maximum numbers in minimum space. Besides, these are very easy to carry as they are very light. We also produce those in a very restricted condition so as to keep them away from any possible infection. This Electric Cot is one of he most advanced designed product. It has the arrangement for to fit in all the gadgets on its side while not creating any problem for the attending doctors and the paramedic staff to the patient. This is adjustable with the push of a button and brings it to the position as desired by the patient. 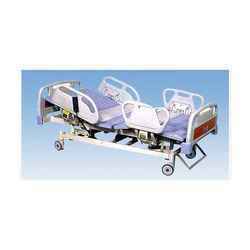 The Fowlers Cot is an advanced cot manufactured to give optimum safety and comfort to the patient. 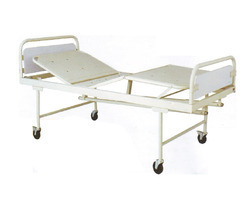 This all side covered cot is certainly very useful for patients in very dangerous situation where their own movement is not fully in their own control. The steel railings are so placed that they will not cause any problem or harm to the patients sleeping on the cot. Sometimes, especially near ambient temperatures, false readings will be obtained indicating incorrect temperature. This is most often due to other thermal radiation reflected from the object being measured, but having its source elsewhere, like a hotter wall or other object nearby - even the person holding the thermometer can be an error source in some cases. It can also be due to an incorrect emissivity on the emissivity control or a combination of the two possibilities. The most basic design consists of a lens to focus the infrared thermal radiation on to a detector, which converts the radiant power to anelectrical signal that can be displayed in units of temperature after being compensated for ambient temperature. This configuration facilitates temperature measurement from a distance without contact with the object to be measured. 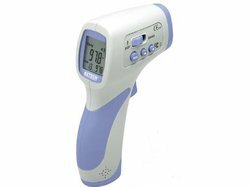 As such, the infrared thermometer is useful for measuring temperature under circumstances where thermocouples or other probe type sensors cannot be used or do not produce accurate data for a variety of reasons. We are a reputed stockist of a wide range of medical equipment that is in huge demand in various health care organizations. 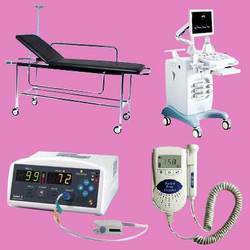 Our range of medical equipment is used in diagnosing, monitoring or treatment of medical conditions. 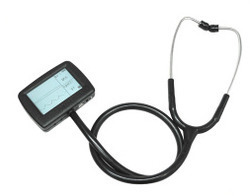 We have a unique range of Medical Stethoscopes which are used to hear the internals sounds of the body. Often, these are used to listen the sound of the lungs and the heart. Moreover, it is also useful in measuring the blood Pressure. With different colors, these are available in different types such as Acoustic, Electronic and Fetal. These are basically used by the medical practitioners.